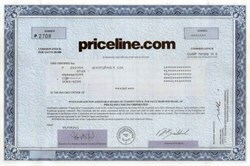 Beautifully engraved Certificate from Priceline.com issued in 2001. This historic document was printed by the Banknote Corporation of America and has an ornate border around it with the company's name on top. This This item has the printed signatures of the company's officers, Rick Braddock as Chariman and Jeffery H. Boyd as EVP, General Counsel. In 1997, Jay S. Walker founded the company, which launched Priceline.com, an online travel site, that used a Name Your Own Price bidding model. In 1999, the company became a public company via an initial public offering, making Walker, who owned a 35% stake in the company, a multi-billionaire. The company experimented with selling other products and services such as groceries, gasoline, home mortgages, and cars, but these offerings were discontinued in 2000. On April 1, 2014, the name of the company was changed from priceline.com Incorporated to The Priceline Group Inc. In July 2017, the company acquired the Momondo Group. In August 2017, KAYAK acquired the assets of Mundi, a Brazilian metasearch company. On February 21, 2018, the name of the company was changed from The Priceline Group Inc. to Booking Holdings. On February 27, 2018, the company changed its ticker symbol to "BKNG" from "PCLN". Priceline.com is the patented Internet pricing system that enables consumers to achieve significant savings by naming their own price for goods and services. Priceline.com takes consumer offers and then presents them to sellers who can fill as much of that guaranteed demand as they wish at price points determined by buyers. Priceline.com's business system currently sells multiple services to customers across three product categories: a travel service that offers leisure airline tickets, hotel rooms and rental cars; a personal finance service that offers home mortgages, refinancing and home equity loans, and an automotive service that sells new cars. Recently, priceline.com announced that it also plans to offer a name-your-own-price service for long distance calling. Online travel company Priceline Group announced today that it is changing its name to Booking Holdings. The name change is fitting, as Priceline�s 2005 acquisition of Booking.com helped turn the company around � one of the few internet comebacks that actually worked. Priceline had gone public at the height of the dot-com bubble and subsequently saw its stock tumble. Booking.com, which had more global name recognition than Priceline.com, helped Priceline increase its more profitable international hotel booking business.